In the first field directly west of the Murrisk standing stone are two more standing stones. These three stones are roughly aligned in an ENE-WSW direction,, but I do not believe they are part of a stone row. This stone is the tallest of the three, standing a 1.65 metres in height. It is the eastern stone in this field, the one nearest to the gate. The three stones are quite similar in profile, all three being almost roughly the same height and width. You can just make out the stone furthest west in the photo. Situated: The stones are located on the opposite side of the road to the Croagh Patrick car-park in Murrisk. Walk west from the famine memorial. Discovery Map 30: L 9163 8246. Last visit June 2014. 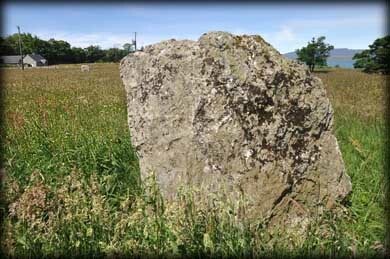 The image above is of the third and most westerly of the three stones at Murrisk. It stands 1.4 metres high and is approximately the same in width. I would suggest, like Murrisk 1, these stones are probably best viewed during the winter months. The views over Clew Bay and of Croagh Patrick are spectacular from this location. There are many other interesting sites also situated along the R335, such s the megalithic complex at Killadangan, Murrisk Abbey and the medieval church at Glaspatrick. Some of these sites form part of the Clew Bay Archaeological Trail.